← Farmers Classic Preview: Murray Adds His Autograph to L.A.
Agassi & McEnroe Kick Off L.A. With Stars Under the Stars. On a cool yet pleasant night, the Farmers Classic event in Los Angeles kicked off Saturday night with a double bill of exhibition matches all set up to benefit the Andre Agassi Foundation for Education (AAFE). But before they took the court, Andre Agassi and John McEnroe took part in a brief press conference that discussed the state of American tennis and the now legendary John Isner/Nicolas Mahut match at Wimbledon. But, of course, any match with McEnroe wouldn’t be complete without a few bashings of both racquets and fans. Tonight’s set of matches had all proceeds going to AAFE which benefits the Andre Agassi College Preparatory Academy in Las Vegas, a K-12 public charter school that strives to provide children with a first-class education, while also advocating increased investment in, and accountability for, public schools nationwide. But, of course, the press gathered was mainly interested in what both Grand Slam champions had to say about the current state of tennis and the recent John Isner/Nicolas Mahut match at Wimbledon that captured the world’s attention. After the press conference, the matches got underway with an opening doubles match between former French Open and Australian Open champion Jim Courier pairing up with comedian Jon Lovitz as they took on another former French Open champion, Michael Chang, who played with Gavin Rossdale, lead singer of Bush and husband to No Doubt singer Gwen Stefani. The match was full of good natured fun with Lovitz providing most of the comic relief while former Grand Slam doubles champion Pam Shriver served as umpire. The pairing of Chang/Rossdale finally prevailed in a single pro set of 5-3. 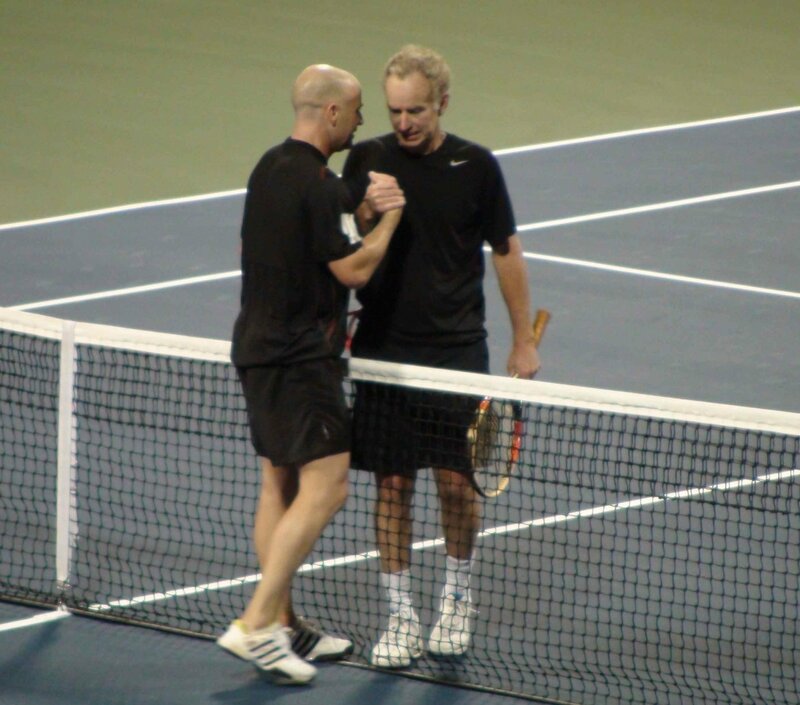 The main event of Agassi versus McEnroe in two sets (and if needed a final set decided by tiebreak) proved to be a competitive affair with both men hitting at full pace and displaying all of their natural gifts. After Agassi broke at 4-4 in the first set to finally take it 6-4, the second set proved to be a one way affair as McEnroe wasn’t able to deal with Agassi’s heavy pace and placement. At one point, a fan in the front row said something about McEnroe’s losing effort which set off “Johnny Mac” into a heated exchange with the spectator. That outburst, along with three busted racquets, didn’t help McEnroe any as he finally succumbed to Agassi 6-4, 6-2, in just over an hour. Despite this tirade from McEnroe, the event was a success which saw the tournament’s sponsor, Farmers Insurance, present Agassi earlier with a check for $200,000 for his foundation. That, along with the ticket sales for tonight’s matches, also going to Agassi’s foundation, showed that Agassi’s greatest legacy may not be his eight Grand Slam titles, but his continuing efforts to improve the lives of children throughout the United States. Comments Off on Agassi & McEnroe Kick Off L.A. With Stars Under the Stars.